Ferrari have once again introduced a completely new concept in Formula One, now by cutting open the nose cone and creating a channel through the nose itself. Although the idea is not new and has been discussed in the F1technical forum extensively, it is the first real implementation. The idea originates from the fact that the nose cone obstructs the front wing's upward air stream. In the centre of the wing, the airflow previously hit the underside of the cone, creating extra drag and also reducing the efficiency of the front wing itself. 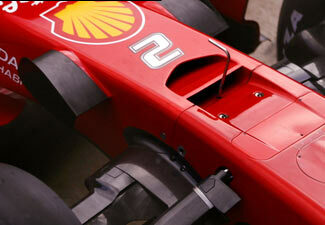 Yet, the new Ferrari design allows for that upward air to flow through a channel in the nose. It exits above the nose, just ahead of the front suspension components. Despite its negative drag effect on top of the nose, the improvements under the nose are substantial. Not only will the upward airflow be smoother, it will also create a lower pressure area under the nose. As a result, molecules tend to fill that void and flow faster along the front wing, further improving the efficiency of the front wing. What do you think is in between the hole area? Would you think that there would be wings or the like to direct the air to wherever it is needed, or is it mainly and plainly a hole? I\'d say it\'s a big hole, and I do suspect that splitter within will vanish. Would this provide positive effects along the entire underbody of the car? Since you are keeping the high-pressure flow away from the underbody in the first place, low-pressure is maintained further back along the under side of the car which results in more downforce. Am i crazy? How does the duct, which directs high pressure flow away from under the nose cone area over to the top of the car, affect the diffuser\'s performance? If at all. Since it is reducing the incoming air which will eventually make its way to the diffuser in the rear end. Also, with the upwash of air going toward the rear wing, providing more downforce, could it also be used to put more air in the airbox, resulting in more horsepower with more volume of air going into the airbox. Won\'t there be an additional effect from the Bernoulli / Venturi effect actually sucking the air out from under the car. There would be a pressure drop at the front of the car and correspondingly a much lower pressure area towards the back of the car. This should increase downforce and will be proportional to speed. Am I banging on about something completely unrelated? If my memory is right, it was Rory Byrne and Harvey P. that pioneered the high nose for the modern F1 car. This was in the days of no height restrictions on front wings but the philosophy seems to have held into the current era. That is get the nose up and let the air flow to the barge boards and the rear diffuser to generate downforce mid car and in the rear. In order to get a decent air flow through this nose duct, the pressure above the nose must be lower than that below. Fine, this can work but do you really want to get the air out from under the car.??? Not so shure. It will be interesting to see if other teams adopt or try the same thing. I suspect it will tie in to the front wheel fairings, the barge board design and the 2009 aero regulations. More likely the latter. If the concept really provided a benefit, wouldn\'t the same thing have been evident with the McLaren Ant-Eater nose design of a few years ago. This was just putting the duct outside the nose, not inside it. Just one question, will it be legal under 2009 rules? I wouldn\'t think so, only flip-ups and winglets etc are banned in 2009 AFAIK. The eagerly waited nose cone has finally arrived... But i am just wondering how it is going to effect the handling when following another car. i mean will it change any behaviour of the car... Will it improve or get worse??? Kudos to Manchild who suggested this idea in a forum thread here a while back. I hope Ferrari work out a royalty payment for him. Saribo: History Note: If you want to find the origins of the internal front wing look at the 1967 Chaparral 2E. I think this was before the Lotus. Many of the aerodynamic advances in automobiles can be traced back to Jim Hall’s Chaparrals. Also - just a thought - could the duct be made to stall (choke?) above a set speed? Thus decreasing front wing downforce and drag? 1: that nose-cone is probably a damn sight heavier as building a crash-structure into that would have been a bugger. 2: There will be no beneficial effect of extracting (second-hand low-energy) air front behind the front wing out the top of the nose cone - it will however be a slight benefit to a small central section of the front wing. The additional drag it creates will be the main deciding factor IMO. 3: It\'s worth noting that the cars whose nose angles sharply up behind the front wing (McLaren\'s) are unlikely to see this development but those that don\'t (Renault\'s) may very well try it out. It interests me to see how the spray behaves in a wet situation. A bit of innovation at last!! If you watch closely, the nose cone of the new F2008(with the innovative aerohole)has a changed underbelly.The nose has the shape of an inverted aeroplane wing on the underside.This will enable the nose to create more downforce on it\'s own.That\'s exactly what Ferrari has been talking about.The aerohole will just help air to pass over the inverted wing.This is especially good for next year, which has a limitation on car\'s aerodynamic downforce. It will be interesting to see what effect it has in the wet i.e. throwing spray up into the face of the driver. Found a car update? Let us know!